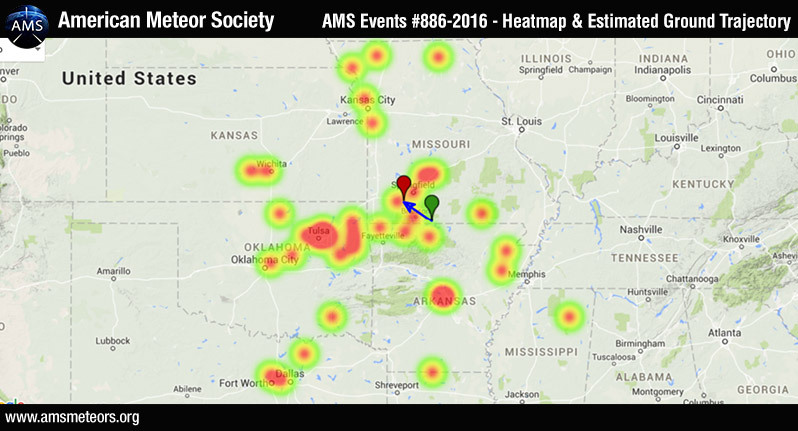 The American Meteor Society has received about 40 reports so far of a bright fireball on March 4th, 2016. The fireball was seen primarily from Missouri and Oklahoma but witnesses from Kansas, Arkansas, Missippi, and Texas also reported seeing this fireball. This event occurred near 10:53pm CST (04:33 on March 5th Universal Time). More info about fireballs can be found here. The preliminary estimated trajectory plotted from the witness reports shows the meteor was traveling from the South East to the North West and ended its (visible) flight few miles East of Marionville, MO. Standing on deck in southwest Michigan, we witnessed what looks like a “fireball” that filled the sky with light. It broke into pieces at the end and was bright white with orange, purple, and green shades. At least three seconds long…. Hope someone had a camera going!! !